After a violent clash with his handlers, Skyman’s at odds with the agents of the program that created him-and now he needs to fight his way out of dangerous airspace into friendlier skies before things get worse! Knowing he can’t fly solo, the new hero seeks an alliance with a fellow patriot, but will he be greeted as friend or foe? As per the end of the previous issue, Eric is flying off angry, after discovering that his handlers have been using the Skyman program as a public diversion to carry out covert assassinations. He’s not exactly sure where he’s going to go or what he’s going to do, he’s just flying. 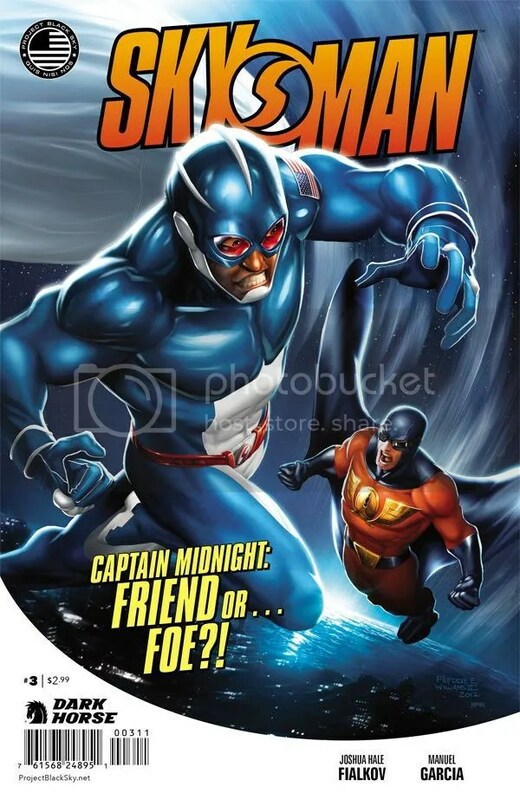 And he’s soon joined by another superhero, Captain Midnight (who, as I mentioned in my review of Skyman #1, this title spun-off from). As I said before, I’m not familiar with Captain Midnight, since I don’t read that title, but we get a little info on him here. Basically we learn as much Eric does, so it puts us in his POV. They meet mid-flight and when Eric tells him what’s happened, Midnight seems to instantly believe him. Since Eric’s Skyman suit is overheating, Midnight takes him back to his own secret HQ. Midnight was a superhero, possibly with a military background himself, back in WWII. Something happened, we don’t know exactly what, but he went somewhere and now he’s back in the present, not aged during that time. He also is a technological genius, who built his own superplane, and he also fixes Eric’s Skyman suit, making it even better than before. Meanwhile, the military is after Eric, and have tracked him to Midnight’s HQ. So the heroes suit up and take the skies against a squadron of fighter jets, led by Lieutenant Sharpe, who has been authorized by General Abernathy to use lethal force. Another action packed issue, written well by Joshua Hal Fialkov, with capable art from Manuel Garcia. I’m excited about reading the next issue, because I want to see how this story plays out, but am also sad that it will be the last issue of this miniseries. Because it’s been pretty good, so far.